Just plug TV Free-Way™ Gold in and you're ready to start watching your favorite broadcast TV shows. Thanks to gold-plating, you'll receive a high-quality signal transfer so you can watch your shows in HD. Did you know that over 90% of today's top-rated TV shows can be watched for free? That includes live sports, news, the hottest sitcoms and more - all for free. With TV Free-Way™ Gold, you plug it into the back of your TV and start watching all of your favorite HD broadcast television shows. 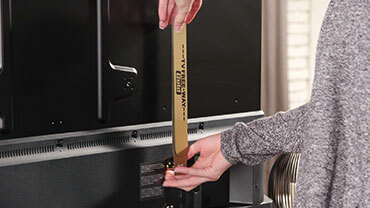 READ FULL DESCRIPTION TV Free-Way™ Gold uses premium gold-plated connectors that give you high-quality signal transfer so you can watch all of the major channels - all in high definition - for free. There's no messy wires, no big ugly cable boxes, or unsightly satellite dishes on your roof. And best of all there are no monthly bills. That's right - no monthly bills. Use it anywhere you want, like on the big screen, in the bedroom, on your porch, or on your TV up to 30-miles out at sea. You can't do that with cable. TV Free-Way™ Gold lets you watch 95 of the top 100 rated TV shows. Enjoy comedies, dramas, movies, local news, and live sports. Simply plug TV Free-Way™ Gold in and play. All major broadcast TV is free! Now you can cut the cord and save over $1,000 per year the free way with TV Free-Way™ Gold. Get free TV forever now! Get your TV Free-Way™ Gold now for only $19.99 and we'll ship it to you for FREE. But wait - double your offer and receive a SECOND TV Free-Way™ Gold that's perfect for a second TV set. Just pay a separate fee of $9.99. This offer isn't available in stores, so order now! Use TV Free-Way™ On The Big Screen, In Your Bedroom, Or Even On A TV 30-Miles Out At Sea! With Super-Easy Installation, You'll Be Watching Your Favorite Shows In No Time - Just Plug It In! Check out these other great products by TV Freeway Gold. OFFER: Get your TV Free-Way Gold now for only $19.99 and we'll ship it to you for FREE. But wait - double your offer and receive a SECOND TV Free-Way Gold that's perfect for a second TV set. Just pay a separate fee of $9.99. This offer isn't available in stores, so order now! GUARANTEE: Your satisfaction is 100% guaranteed. If you are dissatisfied with your TV Free-Way for any reason, simply return the product within 30 days for an easy refund of your purchase price, excluding shipping and handling. See our return policy for more information. Exceptions may apply.